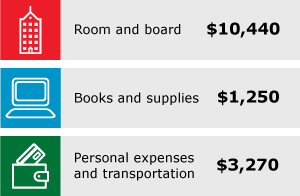 Estimate how much you'll need for college life and learn how to manage those expenses. When it comes to figuring out how much college will cost, tuition is just the beginning. Carefully managing your college expenses and planning out ways to pay for them can reduce the likelihood of overspending and accumulating unnecessary debt. Here are a few steps you can take to help you afford these additional college expenses. Step 1: Break down your primary expenses. To help validate these costs, consider checking the college’s website for content and tools, which will help give you a better sense of the actual costs at the school. Step 2: Identify areas where you can cut back or earn incremental funds. Evaluate if it’s less expensive to live in a dorm or off campus. Consider sharing your food and housing costs throughout your time at school to help bring down your total college expenses. Purchase used books or take advantage of your school or other book rental programs, if available. Walk, bike, or use public transportation rather than driving a car, thus reducing your gas and parking expenses. Take advantage of student discounts on meals at restaurants, movie tickets, or transportation with your student ID card. Consider limiting the number of times you go out to eat. Avoid unnecessary expenses, such as library late fees and parking fines. Plan your courses carefully. Returning to school for an additional semester to get that one last required course is expensive. Work study, on campus jobs, or a part-time job are examples of possible ways to offset some of those incremental expenses. Step 3: Create a budget. Once you have a good idea of how much college will cost, creating and sticking to an actual budget for yourself can help you live within your means. A cash flow worksheet can help provide an account of where you’re spending your money (rent, books, gas) and where you’re earning money (part-time job, work-study, savings). If you’re spending less than you’re earning, you’re in great shape. However, if your expenses exceed your income, it would be wise to look at where you could cut back, or how you could bring more money in. If you’re starting out as a new student, college may be the first time you’ll be solely responsible for your regular budget. By going in with a plan to manage your college expenses, you can better prepare yourself to handle this new responsibility.